My street was deserted Sunday, when a couple of friends and I checked on it. A few military types were cutting away at the trees blocking a major intersection nearby, and, at one point, two guys who live around the block stopped by because they saw our cars outside. Beyond that, the neighborhood was a ghost town, just like most of the rest of New Orleans. The people who lived here until two or three weeks ago have gobbled up real estate in Baton Rouge. Or they're holed up with relatives. They're sleeping in sports arenas, or they've accepted offers of refuge in far-flung towns across the country. In Utah right now, the natives must be mystified by these odd newcomers, who call everybody "baby" and start long conversations with strangers in the grocery line.This exodus from New Orleans, we keep hearing, is one of the greatest mass movements of Americans since the Civil War. But Hurricane Katrina didn't start it. The diaspora has been going on for years. The dearth of high-paying jobs-- and the corresponding brain drain--has been the focus of every major political campaign in Louisiana in recent years. When she ran in 2003, Kathleen Babineaux Blanco vowed to be "the governor who brought our children home." Houston, Atlanta, and other Sun Belt cities were already crawling with ex-Louisianians when the hurricane formed. The storm only accelerated this and other baleful trends. New Orleans is one of those cities that inspires fierce loyalty from its residents. But, if evacuees find better jobs and safer homes elsewhere, they might well come to view leaving New Orleans as a necessary step, like a painful breakup that was bound to happen sometime or other. The images that have poured out of New Orleans since Katrina hit--weary evacuees, rampant looting, corpses lying uncollected for days--have been searing, and they hardly seem to come from the same planet as the fun-loving New Orleans of lore. But, in fact, many of these images hint at a malaise that existed long before the storm. Take the looting at the Wal-Mart on Tchoupitoulas Street the day after the levees began to fail. The store itself opened last year as part of a "redevelopment" of the decrepit St. Thomas public housing complex. The plan, according to critics, involved a net loss in cheap housing units and a tax scheme that helped the world's largest retailer. The public debate was loud, long, and acrimonious. None of this quite explains why people used Katrina as an excuse to relieve the store of its flat-screen televisions, but resentment was clearly simmering well in advance of the storm. So were a lot of other problems. An iconic photo floating around the right- wing reaches of the Internet shows a parking lot full of waterlogged New Orleans school buses. Ostensibly, it proves that Democratic Mayor Ray Nagin missed the chance to get more people out before the storm. But the photo in question says less about the mayor than it does about the school system. The elected school board is independent from other city agencies, and the system is in dreadful shape, academically and financially. After the system couldn't account for $70 million in federal grants, the state forced the board to hire a private financial manager this summer to sort out the mess. That company couldn't find any reliable records of how many people actually worked for the system, and it reported that the board's latest and supposedly balanced budget was really $48 million in the hole. The incompetence raises an obvious question: If the mayor had sought help from this crew, would that have saved lives or merely wasted precious time? 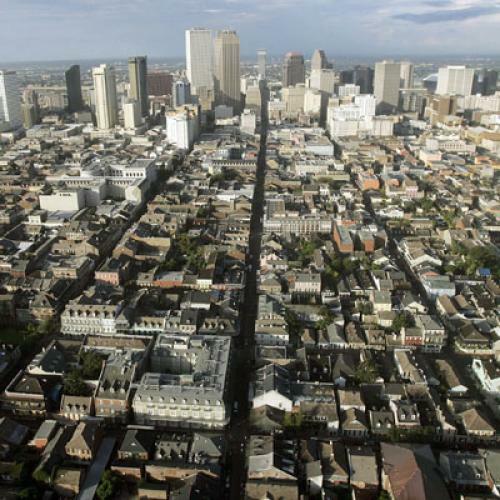 New Orleans's plight comes through in another image: the city's damaged skyline. Office towers lost windows and parts of their roofs during Katrina. But they lost tenants like Amoco long before. Major energy firms used to be a mainstay of the city economy. But, in the late '90s, amid a wave of mergers and consolidations, thousands of good jobs either went to Texas or vanished entirely. It's little wonder that, according to the Census Bureau, the state lost nearly 10,000 more young, single college graduates than it attracted between 1995 and 2000. The population of the entire metro area has crept up slightly in the last 15 years, but only because, most of the time, fewer people are dying than being born. Lots of tourists visit New Orleans for the party atmosphere, but people live here for the relaxed pace, the bright colors on the houses, and the unruly trees and grass and flowers that refuse to yield to the works of man. If you sit out on the front porch at night, the air smells, depending on the weather and the time of year, of confederate jasmine or sweet olive or damp tree bark. Or at least it did. As I write this, much of the city remains under water that has been cooking in 90-degree heat and leaves behind a gray-brown dust when it recedes. Even streets that have been dry for days stink like some long-polluted lake. There are more substantial reasons to worry about the city's future. No one knows whether insurance companies will keep writing policies here or what will happen to all the houses that have been underwater for weeks. Some New Orleans businesses are already moving to Baton Rouge or out of state. Most of the city's flood victims won't be allowed a look at their homes until next week at the earliest, so many of them will return to a netherland of mildew and mold. And, even if reconstruction money starts pouring in tomorrow, New Orleanians have to worry about another enduring pattern: the political patronage that has crippled public services in the city. Over the summer, federal grand jurors indicted some close supporters of Nagin's immediate predecessor, Marc Morial, on charges of squeezing money out of city agencies. A poor city in a poor state can't afford such indulgence. Especially now. The water here is draining faster than most people expected, and it's now possible to fantasize, at least, that life here will go on just as it did before the storm. But to thrive, New Orleans needs a clean break, not only from Katrina's destruction, but from its own recent past.